Like most Thermomix owners, I can get a bit passionate when I start talking about it. I always feel like I have to add a ‘by the way I don’t sell Thermomixes disclaimer’, or people would think I am putting the hard sell on them. So, why do I love my Thermomix, and what do I use it for? Sunflower seed flour We are a wholefoods, gluten free family. This is complicated by the fact that my 3 year old is highly allergic to nuts, chickpeas and lentils. Most wholefood baking recipes use almond meal or besan (chickpea) flour, but we can’t use either. This means I go through kilos of sunflower seeds, and make them into sunflower seed flour. Whenever a recipe calls for almond meal, I substitute with sunflower seed flour. Without a Thermomix, I would be a bit stuck. I could do it in a normal food processor, but my experience is that this can put a bit too much strain on the motor, and eventually they burn out. You can buy almond meal, but you can’t buy sunflower seed flour. Breakfast, lunch and dinner can all be soup. And if people are still hungry outside of these meal times…soup. I make my own chicken broth, and have it available in the fridge or freezer. This makes soup making a doddle. There are even pre-programmed recipes in the Thermomix. It takes a couple of minutes to assemble everything, and then 20-25 minutes to cook, and hey presto a healthy nutritious lunch. The only down side is the size of the Thermomix. You can only make a few bowls at a time, so there is never enough to freeze. Mashed potatoes or mashed sweet potatoes. Being Irish, I am fond of the occasional spud. The Thermomix makes great mash. The automated recipe uses milk, but I substitute this for chicken stock or bone broth for an extra nutrition boost. It’s an easy way to get broth into my kids. I can set the Thermomix up to cook, then go to do the daycare pick up and when I get back the mash is ready. 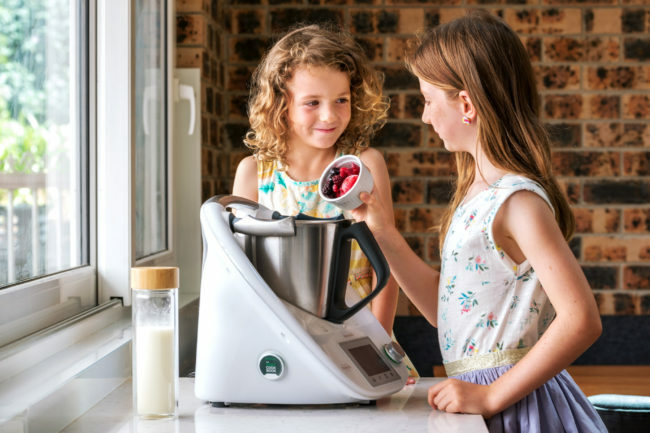 It is so easy to make yoghurt or cultured cream using the Thermomix. There is no fiddling around with thermometers, as the Thermomix has one built in. Although my kids are pretty good at eating their veggies, I take every opportunity to sneak more in. If I am making a chilli or bolognaise, there is usually as much vegetables as meat in them. They are not keen on onions or silverbeet, so I add these in, as well as the sweeter vegetables. Sure, you could chop them by hand, but it would take a very long time and it would still be a fine dice. This way you can puree them, and they make a rich homogenous sauce. I make my own kefir and serve it to my children in the form of a smoothie every day. Doing this in a thermomix you can use frozen berries, frozen banana or whatever fruit you prefer. The result is a cafe style smoothie, that your child will never guess is so good for them!